In September of 2017, Hurricane Maria devastated Puerto Rico with Category 4 conditions that wreaked destruction to the island that is still felt today. The most tragic result of the storm was, of course, the nearly 3,000 people who lost their lives, but the hardest lesson learned for Puerto Rico’s future sustainability is the need for reinforced infrastructure to protect from long-term economic hardships. Undoubtedly, the most damaging economic effect from the storm was the long-term loss of power and communication paired with the slow government response. The pharmaceutical industry is enormous in Puerto Rico, with more than 50 manufacturing sites crammed into a landmass the size of Connecticut. To put the island’s pharmaceutical contributions into perspective, the United States population utilizes more drugs from PR than any other state or country. And unlike the manufacturing of electronics or clothing where the raw goods can simply be stored away in a crisis, much of drug manufacturing relies on keeping vats of microbial cells alive in very specific preferences and temperatures so that they can pump out antibody drugs. Needless to say, it takes a lot of power to maintain pharmaceutical manufacturing conditions and temperatures, and a loss of power–even for a short period of time–can eradicate hundreds of thousands, if not millions of dollars in product. To protect against Mother Nature’s wrath this hurricane season, Industrial Motor Power Corporation was engaged by a major pharmaceutical company to ensure that regardless of rain, winds, and blackouts, their lights would be kept on. Originally reaching out to IMP’s Florida-based subsidiary, Rental Power Solutions (RPS), the client was in need of at least 2,000 KW in power for an unknown duration. As RPS fulfilled the client’s temporary energy requirements on the island, the need for a larger and more permanent power solution began to materialize. RPS then tapped IMP Energy Solutions to address the client’s long-term independent power production plans. IMP Energy Solutions then designed and installed a custom 8MW plant comprised of three Caterpillar XQ2000 power modules and two XQ1000 modules, and is now managing this IPP project for the life of their operations in the region. The Caterpillar XQ2000 portable generator is the go-to mobile power solution. 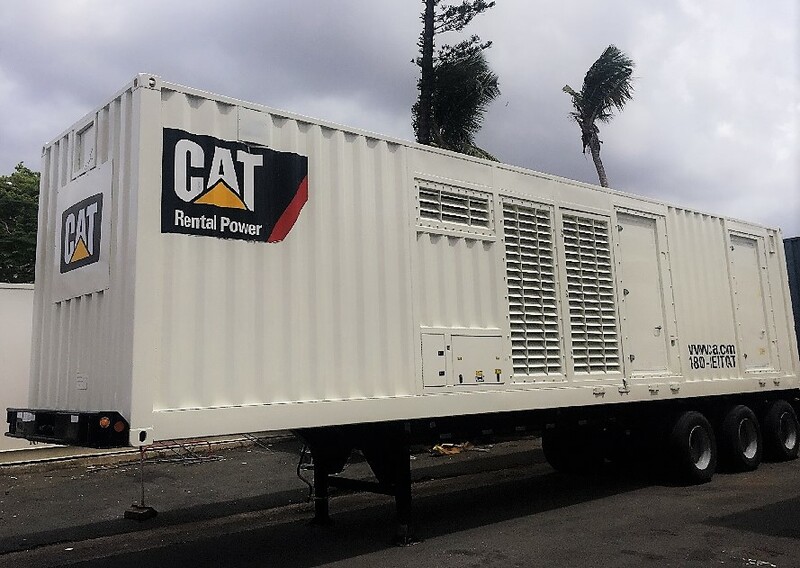 Powered by the 3516 Tier II ATAAC diesel engine, this unit is rugged and reliable; it’s the perfect solution for large-scale on-site power needs. Its SR4B generator is specifically designed to fit the output and performance characteristics of the 3516 diesel engine. And as sign of its global popularity and reliability, there are many XQ2000 packages that are dual 50/60 frequency. Riding in a mobile container, it stands 40 feet long, and has a sound attenuated air intake louvers and enclosure, along with complete coolant and oil spill containment.